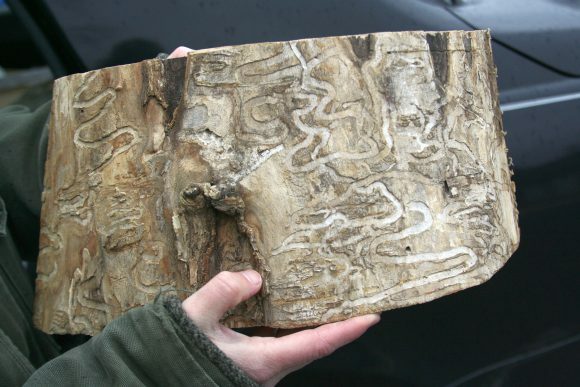 Share the post "Rutgers DNA Genotyping Lab Helps in Statewide Fight Against Emerald Ash Borer Infestation in New Jersey"
Cross-section of ash tree with damage from the emerald ash borer. The Rutgers DNA Genotyping Lab, located in the Department of Plant Biology, has enjoyed tremendous success in sequencing plant genotypes, conducting extensive genotyping and sequencing that support New Jersey Agricultural Experiment Station’s plant breeding program, including turfgrass, basil, dogwood, hazelnuts and cranberries. 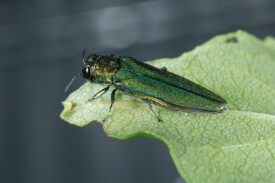 More recently, the lab has partnered with the New Jersey Department of Environmental Protection (DEP) to help protect populations of ash trees from the emerald ash borer (EAB). Originally from East Asia, the ash borer is an invasive species of beetle known to decimate populations of ash trees, particularly the rare Pumpkin Ash here in New Jersey. The beetle infests trees, feeding under the bark, stopping nutrient and water flow. Trees die within three to five years after infestation, depending on the size of the tree and EAB population. As a first step toward their conservation, DEP has teamed up with the Rutgers DNA Genotyping Laboratory to differentiate Pumpkin Ash trees from the more abundant Green Ash trees. Samples of leaf tissue, taken from a chosen grove of mixed ash trees during summer 2016, were sent to the Rutgers DNA Genotyping Lab. Using a process called sanger sequencing to observe differences in DNA sequences, assistant research professor Josh Honig and professor Brad Hillman observed the ribosomal internal transcribed spacer regions in the leaf tissue samples to accurately differentiate Pumpkin Ash from Green Ash. 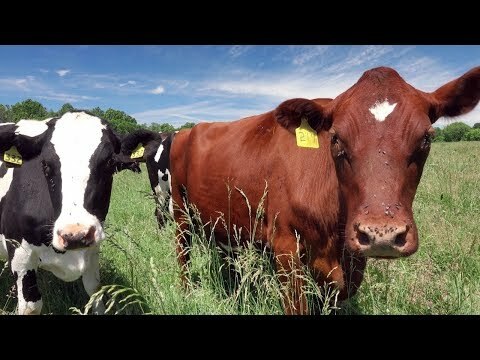 “The process isn’t entirely universal, but it can usually distinguish many species from one another,” said Honig. According to Honig, samples were initially taken from known Green and Pumpkin ash trees to ensure there was a true sequence difference. To make the DNA extractable, the Genotyping lab ground the leaf tissue samples in liquid nitrogen until it became a fine powder. Once the DNA was extracted from the powder and the sequences were differentiated, Honig was able to help Rosa Yoo of the DEP create a plot map to mark trees as either Green or Pumpkin Ash. This information will be used to identify the Pumpkin Ash trees for EAB treatments and seed collections for banking purposes. “The project was our first opportunity to collaborate with a state department, and we helped save a rare species in the process,” said Honig. The research conducted by the lab can be implemented on a larger scale to help identify the general population of Pumpkin Ash trees across New Jersey, enabling land managers to protect the existing populations from EAB. There are approximately 51 municipalities across New Jersey known to have populations of Pumpkin Ash, some 5,500 trees in total, according to the International Society for Ecological Modelling. Tracking the spread of EAB and identifying endangered Pumpkin Ash are important restoration strategies used in concert with certain pesticides that help prevent EAB infestations.